A year or so ago I stumbled over Koding (my referral, if you're feeling benevolent), a social development platform that gives you (and everybody on your team) a disposable Ubuntu virtual machine, a web-based SSH terminal and code editor, and a giant network of fellow devs. It's a nifty place, and I've used it to collaborate with friends, teach myself Django and R and AngularJS and CoffeeScript, work through Coursera algorithms homework, develop new web applications, test documentation, play with Node modules I don't want on my regular machine, and so on, ad infinitum. The Icelandic team behind it wants to make the world a better place. It's unique. 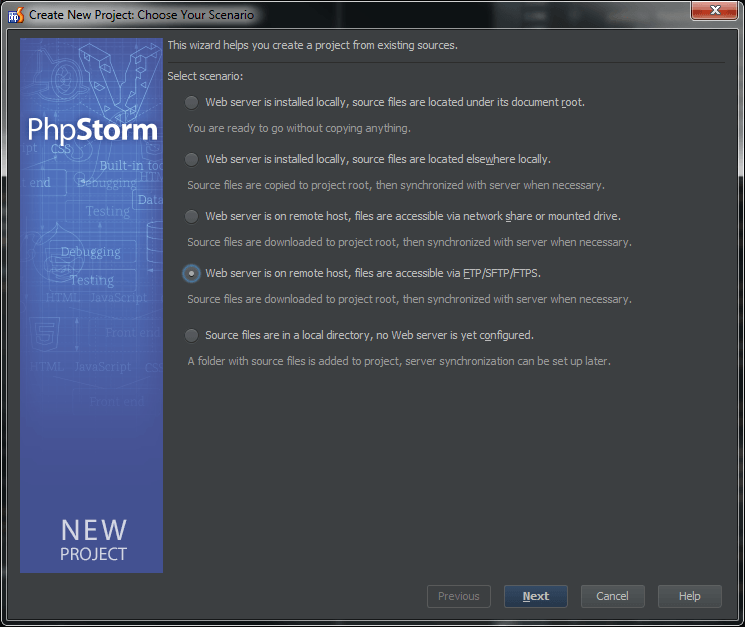 Naturally, I wanted to hook it up to PHPStorm. Koding VMs sit behind a proxy, so SSH-ing in from an external system already requires some finangling. PHPStorm's remote deployment system is entirely finangle-free, so getting it communicating with Koding would be impossible without our secret weapon: SSH tunnels! In my PuTTY config, I loaded up my copied Koding session and found Connection → SSH → Tunnels. I checked both boxes at the top. I set Source port to an unused port on my local system. I set the Destination to localhost:22 (note that that's localhost relative to my VM, not to my local system), and selected the Local option. Perfect! Whenever I want to use my Koding tunnel, I'll run the new session and let it sit. You can even test it: Open the tunnel, and then fire up a brand new PuTTY session pointed at localhost:12345. You'll get shunted through the tunnel and end up in your Koding VM. That's it! 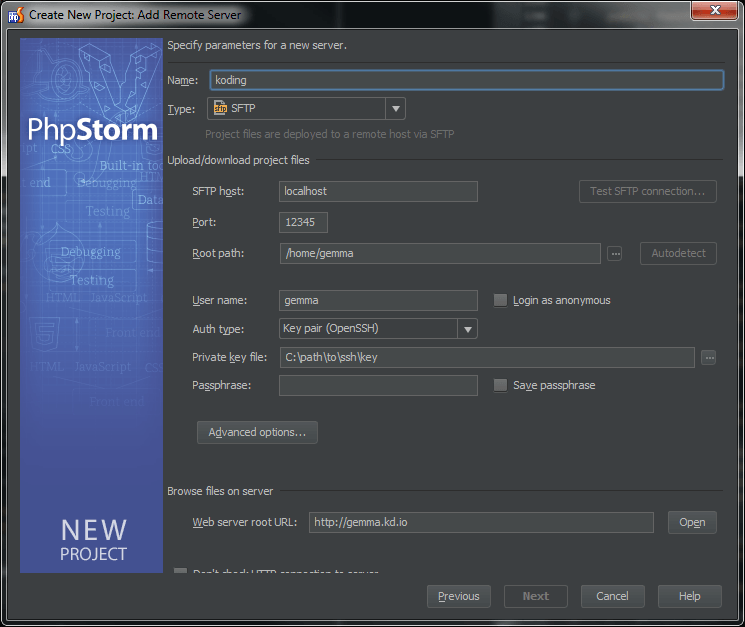 PHPStorm can now deploy your project directly to your VM--it'll even run your PHPUnit tests for you. You'll need to set up root paths and directory mappings, but the hard part's over. I have drunk the koolaid, and it is purple and orange. Swirled. Without mixing. Because magic. I thought JetBrains just made Eclipse knockoffs until I started watching the short AngularJS tutorials at egghead.io. Resident guru John Lindquist wields WebStorm like a syntax-highlighted scalpel, flying through line after line of auto-generated code as easily as most of us breathe. I got excited just watching. The AngularJS tutorial content is great too, but that editor. I'm fast in vim, but not that fast. I'm taking the Algorithms I class from Coursera that just started up again. (I'm going to finish it this time.) (No really!) The first programming assignment has students building a Monte Carlo simulation for the percolation problem, using a weighted quick-union algorithm. We'd already covered union finds and the internals of a WQU during the lectures and exercises, so the assignment focused on applying it efficiently. I've already gushed over the amazingness that is btsync, but it just solved another problem for me, so here I am again. who left the burner on?